Our three-day orientation program introduces students to all that Marquette and Milwaukee have to offer. You’ll meet with the School of Dentistry dean and faculty, talk with continuing students about their academic experiences, learn about insurance programs available to single and married dental students through the Wisconsin Dental Association, pick up your dental instruments, and more. On Saturday you will have an opportunitity to join other students and tour the Milwaukee downtown area including the Third Ward, Bradford Beach and other areas of interest to students. You'll learn more about this opportunitity during Orientation! 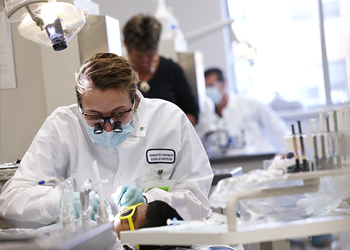 Designed through a unique collaboration with the Wisconsin Dental Association and Pierre Fauchard Academy, the School of Dentistry’s mentorship program is the template for similar programs nationwide. Dentists throughout Wisconsin serve as mentors and advisers to dental students, forming professional relationships and friendships that last a lifetime. The White Coat Ceremony serves as your official welcome into the study of clinical dentistry by members of the dental profession. At the ceremony, you will receive a ceremonial white coat and swear an oath in the presence of family and friends of your intentions and willingness to assume the responsibilities and obligations of the practice of dentistry. This ceremony is managed by the Office of Student Services and Office of Admissions. The Senior Awards Program recognizes academic, clinical and leadership achievements of graduating seniors. The Hooding Ceremony confers the title of doctor. After this ceremony, you can officially use the prefix of "Dr."
These programs are managed by the offices of the Dean, Student Services, Alumni Relations and many other members of the Dental School community. Please complete the following form if you are involved in planning activities at the Dental School.